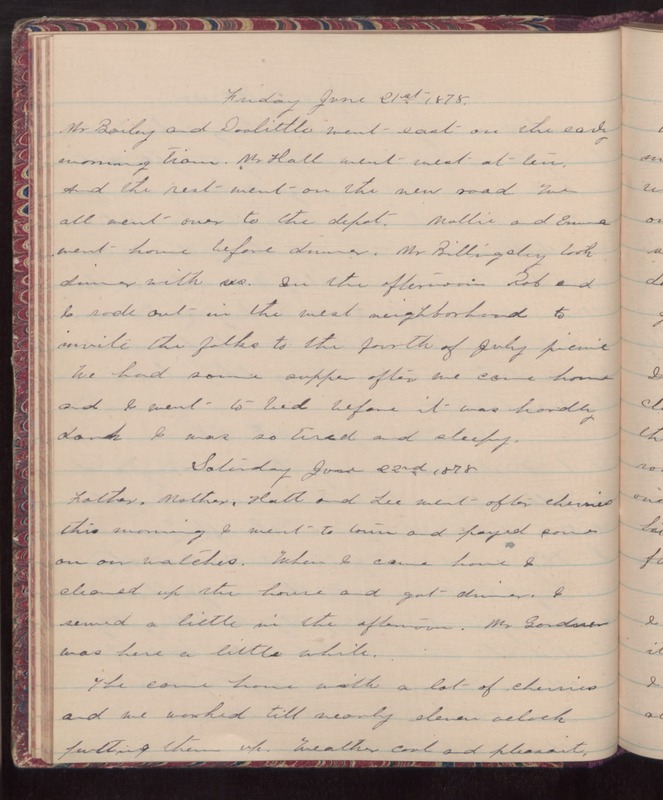 Friday June 21st 1878 Mr Bailey and Doolittle went east on the early morning train. Mr Hall went west at ten and the rest went on the new road. we all went over to the depot. Mollie and Emma went home before dinner. Mr Billingsley took dinner with us. In the afternoon Rob and I rode out in the west neighborhood to invite the folds to the fourth of July picnic. We had some supper after we came home and I went to bed before it was hardly dark I was so tired and sleepy. Saturday June 22nd 1878 Father, Mother, Hatt and Lee went after cherries this morning. I went to town and payed some on our watches. When I came home I cleaned up the house and got dinner. I sewed a little in the afternoon. Mr Gardner was here a little while. The came home with a lot of cherries and we worked till nearly eleven oclock putting them up. Weather cool and pleasant.